Yasar Hayatkhan poses for a photo. The Bureau of Educational and Cultural Affairs (ECA) stands as an advocate for the universal rights of all persons around the world. ECA’s EMPOWER Programs, a series of four separate two-way international exchanges, aim to put disability rights at the heart of our nation’s public diplomacy efforts. Yasar Hayatkhan was one of 11 people from South and Central Asia selected to participate in one of the four EMPOWER Programs.. 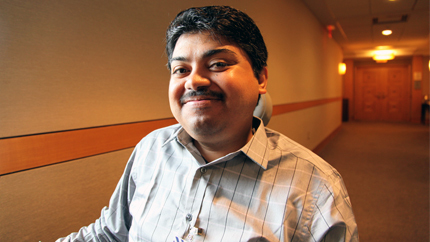 Growing up in Pakistan, Yasar knows firsthand the everyday difficulties of living and working with a disability. When Yasar applied to the EMPOWER Program, the application required he initiate a project upon his return home. Without hesitation, Yasar knew exactly what was most important to him and others with disabilities in Pakistan. Yasar spent one-month working with and learning from Project Search in Cincinnati, Ohio. “Project Search, started in 1996, to train and give employment to young adults with disabilities who graduate from high school and now operates in 250 locations around the world,” says Yasar. Yasar’s goal is to initiate Project Search in Pakistan to help create opportunities for persons with disabilities to find jobs. In August, Yasar’s American host, Erin Riehle, founder of Project Search, will travel to Pakistan to help him establish the program in his home community. “I have found many new friends in the United States and they are lifelong friendships,” says Yasar. While in the U.S., Yasar was heartened by the government’s commitment to accessibility. Upon his arrival, he was given a motorized wheelchair to use throughout the program. Thanks to a donation from the Center for Independent Living (CILO), in Cincinnati, Ohio, Yasar was able to take his motorized wheelchair back to Pakistan.